A tagset is a list of part-of-speech tags, i.e. 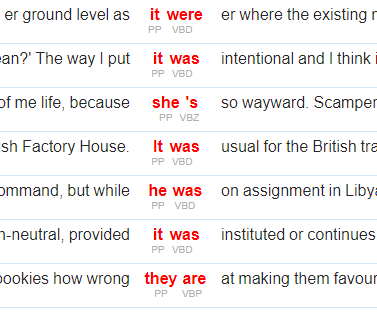 labels used to indicate the part of speech and often also other grammatical categories (case, tense etc.) of each token in a text corpus. The English Penn Treebank tagset is used with English corpora annotated by TreeTagger, developed by Helmut Schmid in the TC project at the Institute for Computational Linguistics of the University of Stuttgart. It contains modifications developed by Sketch Engine (older version). This version below is the older tagset. See the most recent version 2. The table shows English Penn TreeBank tagset with Sketch Engine modifications (older version). SENT Sentence-break punctuation . ! ? M. Marcus, B. Santorini and M.A. Marcinkiewicz (1993). Building a large annotated corpus of English: The Penn Treebank. In Computational Linguistics, volume 19, number 2, pp. 313–330. Sketch Engine offers dozens of English corpora with the Penn Treebank tagset.